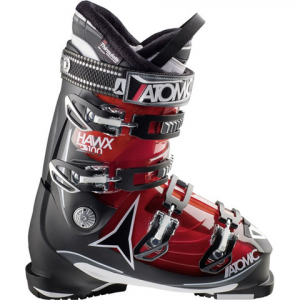 If you're aiming for the top, then start with a solid foundation, in the Atomic Hawx 2.0 100 Women's Ski Boot. Lighter, more comfortable and flexible than ever before, the Hawx is designed for the all mountain rider that is serious about her gear. 3M Thinsulate Platinum Insulation shields against the elements and resists moisture, keeping the foundations of you style warm, no matter how cold it gets. Integrated memory fit in a medium fit molds quickly to your unique shape, ensuring comfort that's long lasting. WTR Grip pads allow for easy walking and unique Power Shift controls allow you to adjust forward lean and stiffness levels so that the Hawx 2.0 100 by Atomic is fully adjustable and custom made just for you.